On a big matchday it is not hard to tell the affiliation of this establishment, the flags of Uruguay are everywhere and fans crowd the indoor and outdoor areas cheering on La Celeste as they did this past summer and every important match before that. 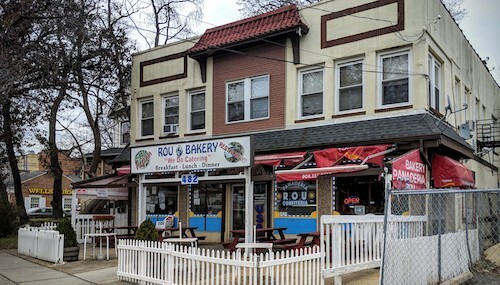 On other days though the place is much more quiet and it may be hard to tell, unless that is you can decipher the acronym R.O.U. in the name. 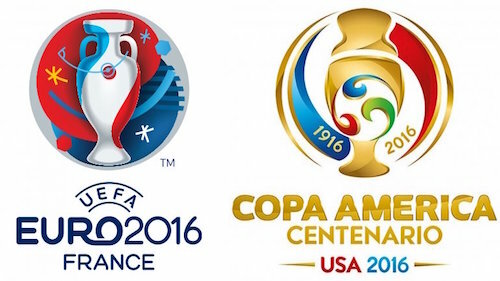 This stands for the official full name of the country: Repüblica Oriental del Uruguay. The bakery is more than just that, it has sandwiches and empanadas, and even advertises pizza although I am not entirely convinced of that yet. You can also come here to stock your pantry with yerba mate, the nation's #1 beverage. 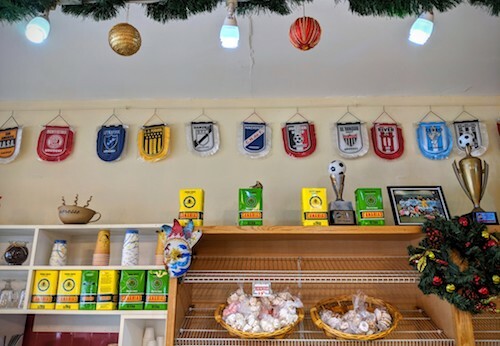 Even on the Friday we checked the place out, football was still an important part of the soul here (as it is with most of Uruguay) as the flags of many teams playing in La Liga Profesional de Primera División are hung right above the counter. The bakery does not take a stand of its own and all are welcome. A typical morning in Uruguay will include not only mate, but an assortment of bizcochos. 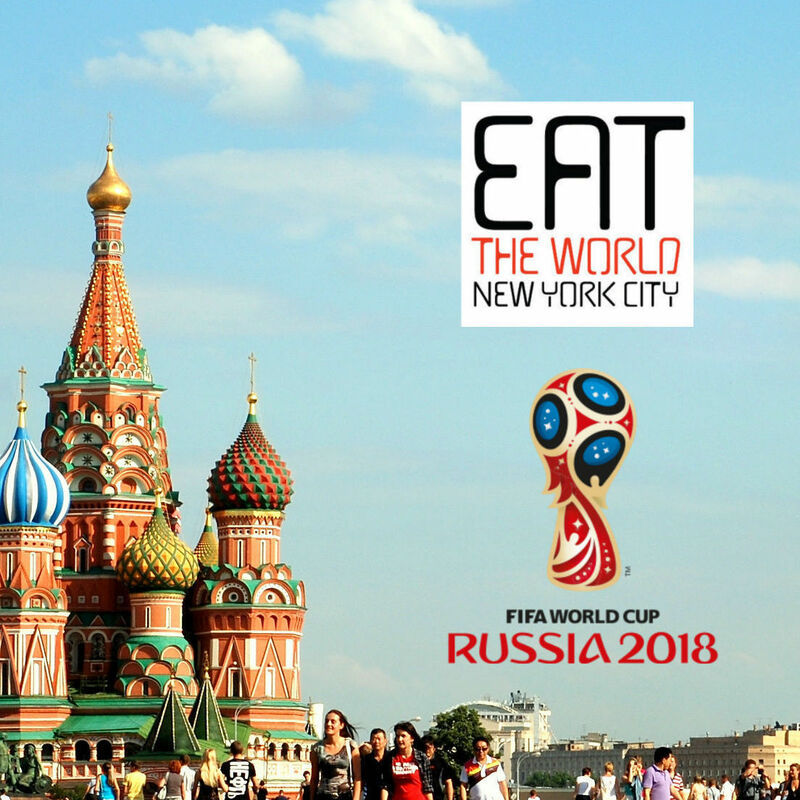 In New York City, this word is associated with Dominican cakes 99 out of 100 times you see it, but over here in Elizabeth the ratios are far more favorable to Uruguay. 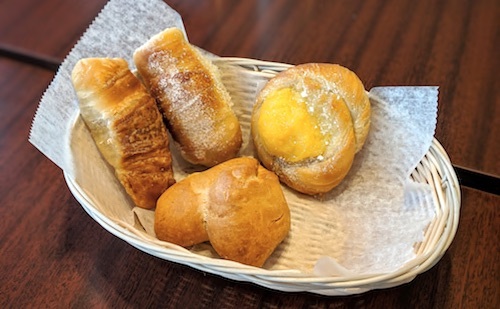 These small pastries are made in many different ways; either sweet or savory, plain or filled. The plain version, at the bottom of the basket below, is full of surprise. The pastry is super light and has a very durable exterior, leading you to believe it is crunchy and dry, but the inside is full of butter and still very moist. Of any, I think this was my favorite. From left to right, the others above were filled with ham, guava, and what was described as "vanilla," although this was more of an egg custard. Having a little assortment is a fun way to enjoy the Uruguayan news on the televisions and sip on your mate, although this strong, caffeine-rich tea is only in a tea bag here. I doubt anyone would oppose you bringing your own mate and bombilla. 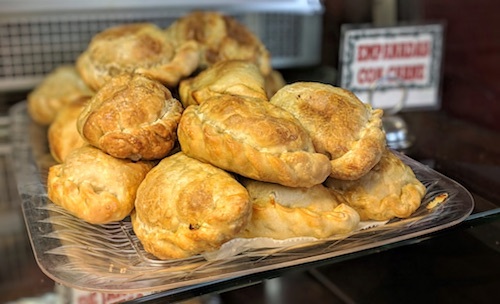 If you happened to miss the display of empanadas in the front as you walked in, go back and take a look and don't pass up the chance on eating some here or taking them home. Four varieties are available, beef, chicken, ham + cheese, and spinach. We grabbed one each of the beef and chicken and were not disappointed. 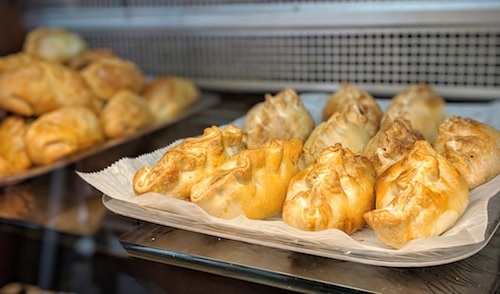 Uruguayan empanadas (above and below) are always baked rather than fried, and are small but well-stuffed with ingredients. 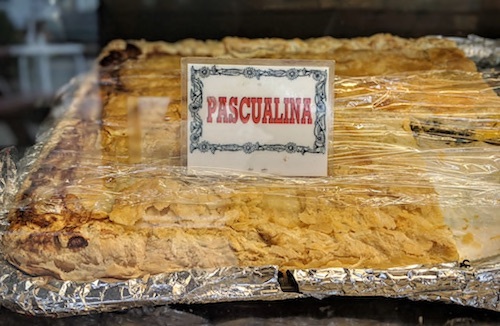 Last but not least, also available is the very Uruguayan mashup food pascualina (below). For more on this egg and spinach Italian-Uruguayan pastry, check out our recent report from nearby Pizzeria Montevideo.